Can you tell us about the Farmer’s Innovation Centre? 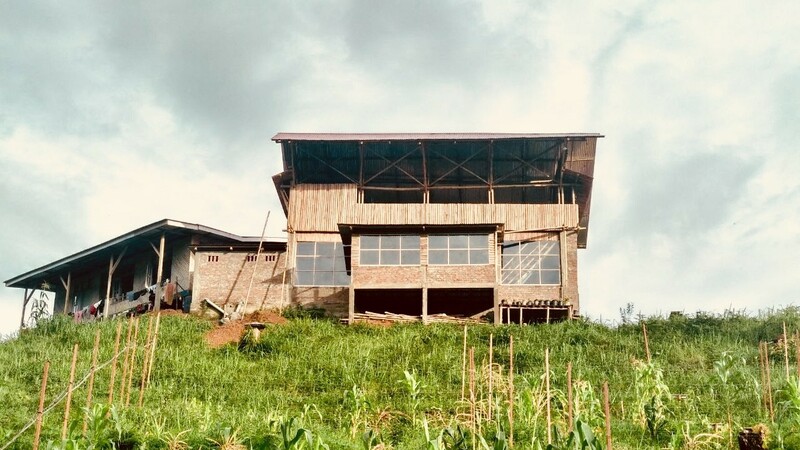 Farmer’s Innovation Centre is located in Angangba, a village in Tuensang district of rural Nagaland in Northeast India, one of India’s poorest and most remote districts. Promoted by Sethrichem Sangtam of Better Life Foundation (BLF), this centre is a space for the development and dissemination of grassroots innovations by farmers and inventors of the region. Built using locally available materials and with traditional bamboo construction techniques, the design is a celebration of the context. The centre caters to the entire BLF community which comprises of up to 700 farmers and their families, offering a diverse mix of spaces which host exhibitions, demonstrations, lectures, workshops, council meetings and social celebrations. 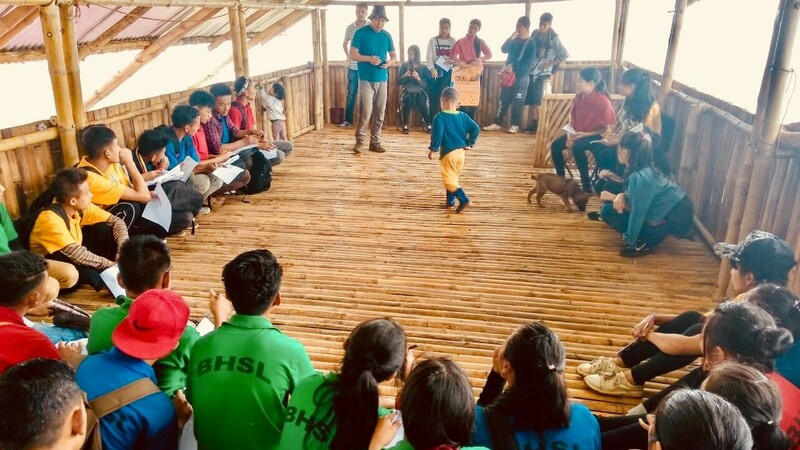 BLF designs community initiatives which are specifically targeted at bridging distances and improving communication – the Farmer’s Learning Centre is one such initiative. How did the idea of this project come about and how was its vision developed? Jayesh and Sethri first met each other in 2016 as part of Shodhyatra - a grassroots journey on foot across 100 Km of the Tuensang District. Sethri had been galvanizing the community around simple projects like goat farms and horticulture projects. Today, he is heavily invested in organic farming through permaculture and the reforestation of slopes. He works with his hands and with people. 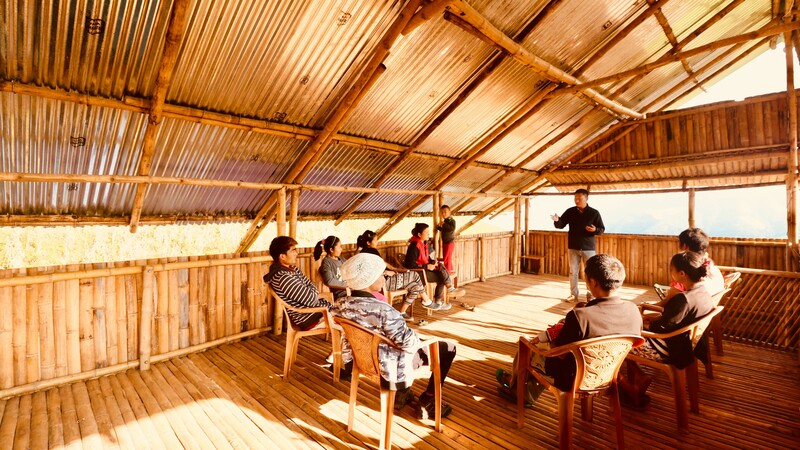 And so, when Uday and Jayesh started working with Sethri to design and build the Farmer's Innovation Centre in Angangba, they found in him not a client but a guide. Sethri’s acceptance of ideas and his value additions in giving shape to the new and distinct activities for the innovation centre were crucial in ensuring the spatial excellence of the finished space. The social entrepreneur and the architects, worked on a twenty-year plan for scaling BLF’s impact in the region. Eventually, their ideas and vision converged on establishing a permanent space - a space which over time becomes a repository of local knowledge, a museum for local grassroots innovations and a centre for regional and global knowledge transfer. The Farmer’s Innovation Centre is a product of this three-month-long dialogue. As a grassroots initiative, what external support that helped make the project a reality? The construction of this centre is the result of community engagement across a range of scales. Masons and bamboo artisans from the local community were engaged to build the structure thereby retaining traditional and well-tested methods of construction. The extended community of BLF beneficiaries helped in the procurement of materials and goods through volunteering and small donations, a global online crowdfunding campaign through Ketto helped raise USD 3000 from 55 donors (out of the projected requirement of USD 9000). Beyond the local community, other contributions included a video on the project’s ethos and vision by Leewardists; the National Innovation Foundation (NIF) donated its entire online resource library and was the first of many nationally and locally sourced grassroots innovations to be placed on display. A professor from Jayesh’s architecture school also offered timely guidance on the structural stability of the centre. Architecture in Development, an early supporter of the project and the cause help create awareness and shared our message and work with a global audience! 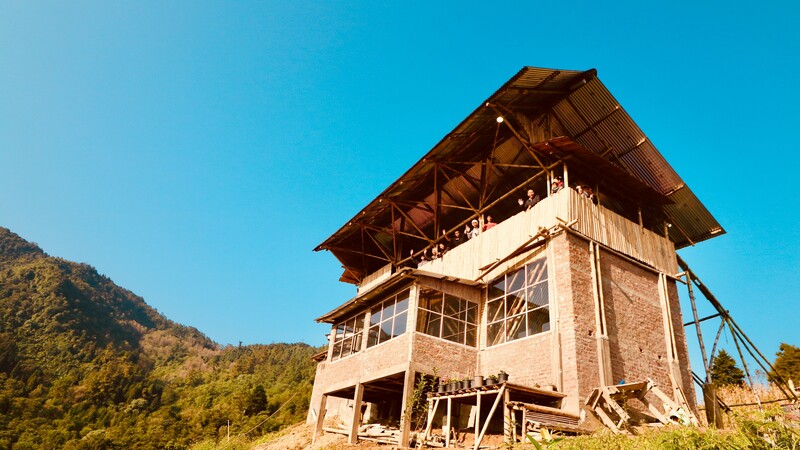 Not On Map, selected as World’s Top 10 Innovative Social Startup by Booking.com Booster and founded by a friend of BLF, Kumar Anubhav, chose the Farmer’s Innovation Centre as a destination for sustainable eco & agro tourism. Upon completion of the centre, many grassroots workers and activists around India expressed interest in volunteering towards the development of activities at BLF with Farmer’s Innovation Centre at the heart of the endeavour. What were the main challenges faced by your team in the execution of this project? The torrential rains lasting up to eight months a year and the harsh terrain posed severe impediments to the procurement, transportation and storage of material. An ingenious solution to overcome the elements was to start by first constructing the primary structure and roof and build from the inside-out. This strategy also helped us during the unforgiving winter. The design of the roof took special attention as it is designed to withstand high-speed winds blowing up from the valley below. Elongated eaves cut the velocity of parallel drafts and the streamlined shape allows winds to traverse the porous top level with minimal impact. 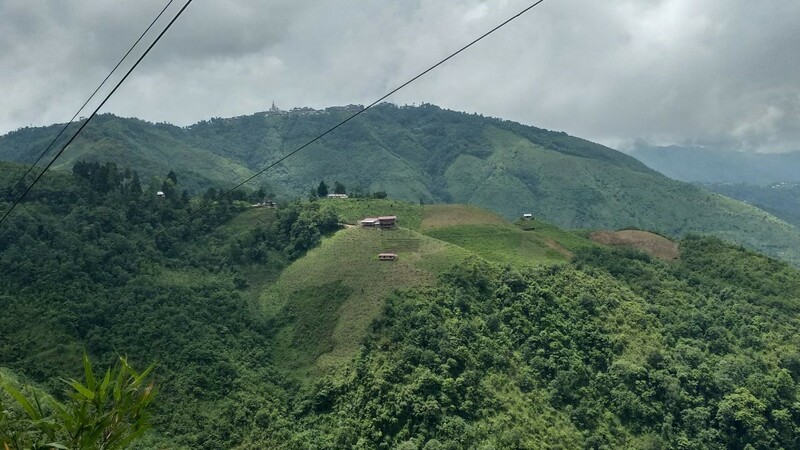 In addition to this, the truck carrying all the bamboo supplies broke down on the difficult terrain and skilled workers kept migrating intermittently throughout the duration of the construction period in search of more lucrative jobs in the nearby towns. What are the key lessons you have gathered from this endeavour? With every passing day during the process of realising the project on ground, the community members started to develop a sense of co-ownership and connectedness with the project. People learned about the value of architecture as integral to the realization of impactful space, and architects learned how to listen to the needs of the community, facilitate dialogue, help formulate a shared vision and translate that vision into physical space. A project like this needs tremendous support. First there must be enough internal resources and trust to form a strong foundation, then the team can ask for external support. It is important to have access to interdisciplinary knowledge and resources for grassroots projects to scale up their impact. Uday and Jayesh’s belief in the cause is thus reflected in the realization of the space. How can space enable social change? What kind of support structures can enable this? Uday and Jayesh’s work is based on the premise that communities inherently believe in architecture as an essential intervention to facilitate positive social impact through the production and appropriation of spaces. Architecture claims its moments by organically responding to the needs and aspirations of the community. First, the centre establishes familiarity through contextual design for the community to engage with it in an uninhibited manner. Second, the space inspires the confidence and trust of problem solvers and offers them an unprejudiced platform to engage in conversation; five spaces - each with a different purpose and size to accommodate different groups in various stages of innovation. Third, the space offers the community a utility that would extend beyond its mandate (exactly the way your local tea shop is more than just a space to drink tea). 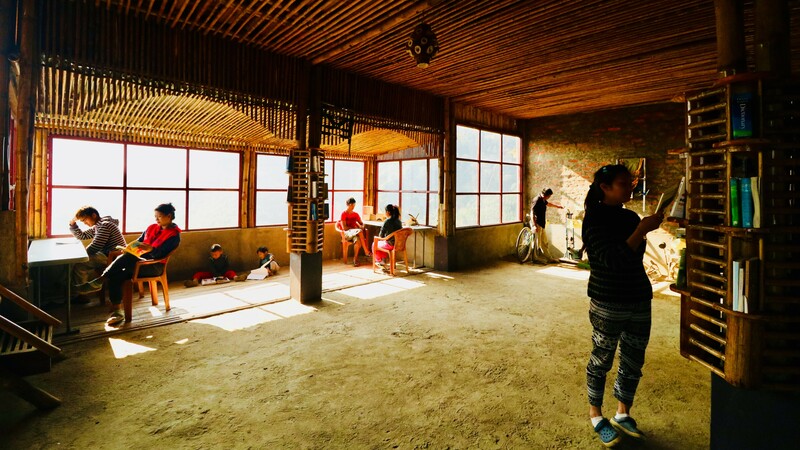 The team adapted the traditional machang or platform and converted it into an elevated platform from where a sweeping view of the landscape could be had over the foliage of the growing wild apple orchard. But perhaps, the greatest testimony to the value of this architecture has been the unconditional acceptance of this space by the local community as an indispensable part of the new culture of farming and innovation. All photos made by Aishwarya Vidhya Raghunath www.aishwaryavidhyaraghunath.com unless specially mentioned. Follow this link Farmer’s Innovation Centre to read more project details and drawings.